Sitting at Kolkata airport. Noticed the usual “Free Wifi in the area!” message and connected to Tata Docomo Free wifi. Performance was quite poor. Entire traffic is getting tunnel via Mumbai i.e West India (while I am sitting on Eastern side). Adding up to latency and performance significantly. So no matter wherever I push packets for, then hit hop 5 – Mumbai / VSNL AS4755 router because likely that is where the core L3 device (MSC/central authentication box) for this network is. This is big issue because likely Tata Docomo would be tunneling entire wifi traffic from anywhere in India, going to anywhere globally via Mumbai because that is where they put their wifi central box. What we need in India is more simpler deployments, more open source stuff so cost doesn’t becomes point of selection for keeping such devices central. And most important we need networks to peer at internet exchanges so atleast East region traffic stays within East and doesn’t has to travel thousands of kilometers to Mumbai just to hop on to another network. Overall speeds seems to be capped at 1Mbps which is too low these days and here’s 100 packet ping to first hop (100.96.128.1) showing how poor is the wireless signal performance. 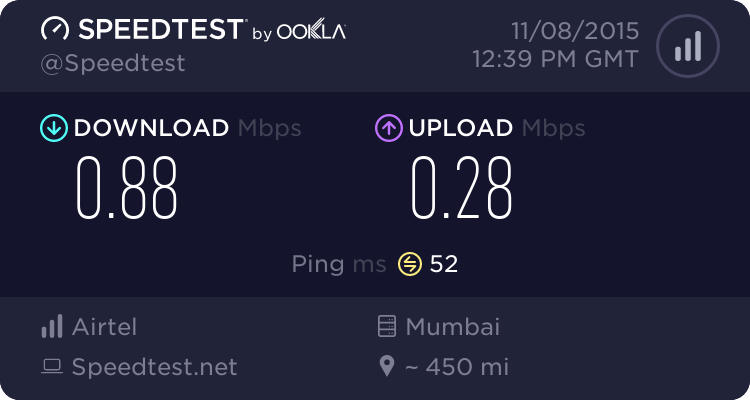 Since latency min is 48ms, quite clearly L3 end is far off in Mumbai and likely would be running ipsec or some other kind of VPN tunnels to the APs. This is ground level performance of what we hear in media “wifi business strategies“. Wifi as a technology is excellent but does take decent homework to deploy properly. Just hanging bunch of boxes and routing traffic from one MSC/central server placed far off doesn’t really helps. Wifi as a technology can help to offload stress on 3G/4G significantly as long as it is done in right way keeping in assumption that Wifi runs on “unlicensed spectrum” and interference can very much happen. Time to catch up flight to next hop!